Interested in booking a workshop or lecture for your guild or shop? I'd love to work with you! I’ve taught at traditional and modern guilds, quilt shops, craft shows, and even at a brewery! Please read more about what’s on tap and email me for rates and to schedule a date. This short-form class is great for shops or venues that would like to host an afternoon of fun for their customers or local community. Attendees will learn the basics of hand quilting and make simple coasters that they can finish and take home that day. Let’s get together and sew! This casual-but-fun event is a great way to get to know each other and just have fun stitching. Over wine and apps, I’ll talk about my preferred materials and methods for hand sewing. Attendees can bring their own materials to sew on, ask questions, and get to know other hand quilters in their communities. Just want to see a trunk show of my latest work? Let’s do it! I have tons of quilts, and we can discuss design, modern quilting, handwork, and the stories behind each one. In this lecture, we’ll explore ways to move away from block-based designs and conceptualize (and create) quilts as a whole. We’ll talk about what a block is (and isn’t), and look at of examples of quilts that have successfully ditched the block. This lecture comes with a great trunk show! Large-scale piecing can create incredibly dynamic quilts, but there are certain considerations to take into account (cutting, working with bias edges, squaring up, marking shapes or quilting motifs, etc). In this lecture, we’ll explore how to create large-scale shapes and what to consider when piecing and finishing a quilt. This lecture comes with lots of great images and a trunk show. In this lecture, we’ll discuss how to "zoom in" on part of a traditional quilt block and transform it into a modern quilt of any size. 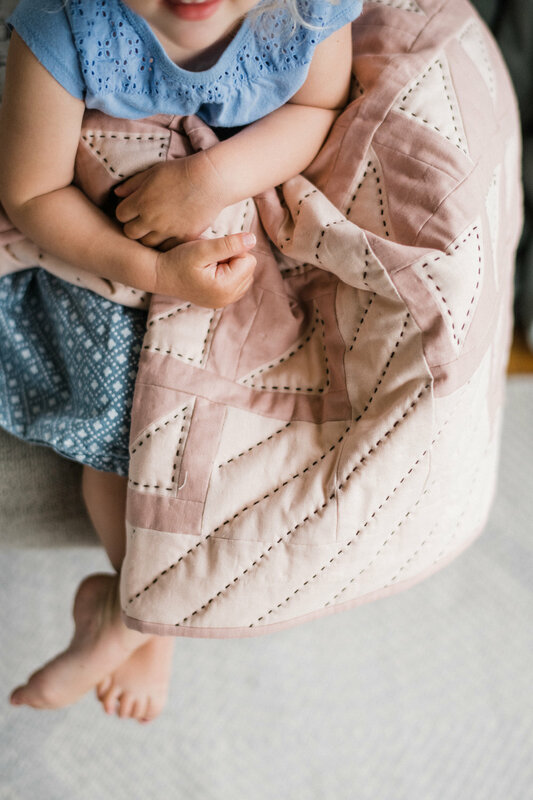 We’ll also discuss the differences between traditional and alternate gridwork, and some of the foundational elements of modern quilt design, including negative space, minimalism, modern color palettes and more. This lecture comes with lots of great ideas that attendees can use as soon as they get home. In this three-hour workshop, students will try their hand at planned and improv hand quilting using large stitches and thick threads like sashiko or perle cotton. Students will learn how to apply high-contrast quilting designs to quilts with large amounts of negative space to create movement, motion and focus in a quilt. We will discuss the technical aspects of hand quilting as well as larger design planning and techniques. In this three-hour class, students will learn how to use Adobe Illustrator to make their ideas come to life as modern quilt designs. We’ll explore the basic tools and skills needed to start designing quilts in Illustrator, and we’ll cover how to set up your Illustrator file to make quilt math easy and fun. This class is suitable for most skill levels, but some familiarity with Adobe products is recommended. Students must supply their own laptop with Illustrator installed. The latest Adobe CC version will be used as the class standard. In this six-hour workshop, students will explore large scale piecing with the Prince or Counterpart quilts from my book, Inheritance. Together we’ll discuss ways to make neat and tidy large-scale designs, as well as troubleshoot common issues. This class is suitable for quilters of all skill levels! In this three-hour workshop, we’ll explore how to use modern quilting elements like alternate gridwork and negative space to transform a traditional quilt block into a modern quilt. Students will explore this method by practicing with paper blocks, then we will recreate the design with fabric at a larger scale. Two techniques will be explored: Cropping a block and adding negative space. 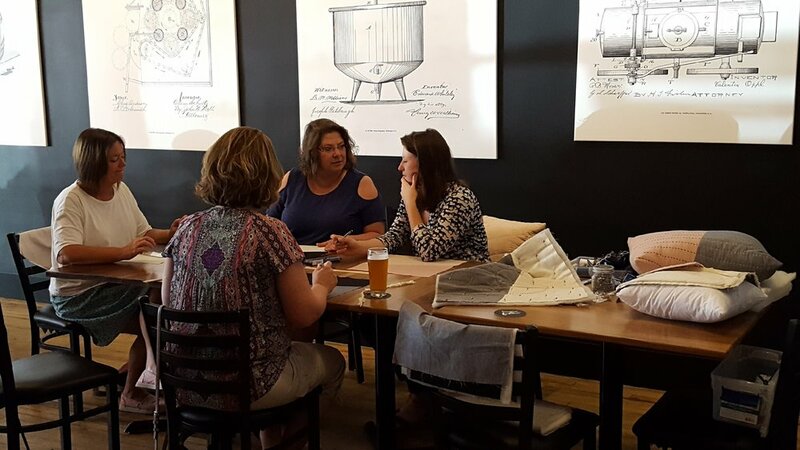 June 2018, Intro to Hand Quilting at Fat Hill Brewing Co.